The article by Joshua Kuchera, “As Islamic Games Open, Azerbaijan Wrestles with Muslim Identity,” published on May 15, 2017, by Eurasianet news organization (Eurasianet.org) does not reflect the objective religious situation in Azerbaijan, Spokesman of Azerbaijan’s Foreign Ministry Hikmat Hajiyev wrote in his article published on the same website. 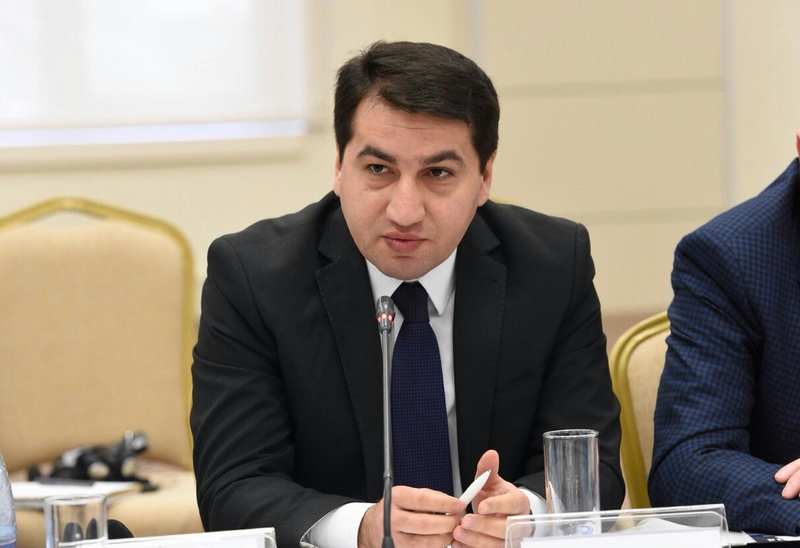 "The author in his article puts in the contradictory context the notions of secularism and Muslim identity, fight against radicalism and religious freedom in Azerbaijan," Hajiyev stated. There is no contradiction between secularism and Muslim identity of the majority of Azerbaijanis as argued by the author, noted Hajiyev. “Secularism in Azerbaijan is not only a constitutional norm, but way of living as well. In a sense, it is a complementary process, where secularism is closely accompanied with high respect for religious values. To understand the essence of secularism in Azerbaijan, one should closely read the late 19th- and early-20th century philosophers and writers of Azerbaijan,” says Hajiyev's article. The spokesman noted that the growing tendency of radicalism and extremism is matter of serious concern for the world, as well as for Islamic societies. "The impact of radical and extreme religious ideologies is also not far away from Azerbaijan. If left unnoticed, they can provide fertile ground for terrorism," he noted. "Therefore, the author incorrectly tries to depict Azerbaijan’s efforts against certain radical elements and terrorism as a violation of religious freedom. All religious freedoms are effectively provided for in Azerbaijan,” added Hajiyev. The spokesman wrote that Azerbaijan on the basis of its successful national experience of hosting the Islamic Solidarity Games makes its contributions to the isolation of radical religious ideologies, the setting aside of sectarian divisions and the popularization of the values of fair competition among the youth in Islamic countries. "It is also an effective response to the growing tendencies of Islamophobia. In the spectacular opening ceremony, the Islamic Games demonstrated that Islam is about peace, understanding, culture, science, knowledge and more,” noted Hajiyev. He added that it is symbolic that in a short span of time, the European Games are followed by the Islamic Solidarity Games in Azerbaijan. "It once again demonstrates that Azerbaijan has become the center of dialogue of civilizations and religions. As a secular Muslim attending the opening ceremony of the Islamic Solidarity Games, I felt proud of my country,” wrote Hajiyev in the article. The 4th Islamic Solidarity Games kicked off on May 12, with a great Opening Ceremony at Baku's Olympic Stadium. During 10 days of competitions, the Games will involve more than 3,000 elite athletes from Islamic countries around the world. This event is an exciting sporting celebration for both Azerbaijan and the entire Islamic world.